Tucked away in the east of France between Burgundy and Switzerland is a place you may not have heard of but must discover, le Jura. Breathtaking beauty surrounds you in this lake region, seventy lakes and basins, both natural and manmade, to keep you busy. 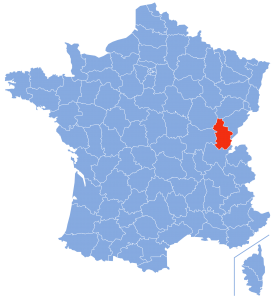 The region gets its name from the Jura mountains to the east. You come here to de-stress from the demands of life, while you hike, bike, sail, windsurf, ski, swim, rock climb, camp, visit unforgettable villages, and enjoy a small and specialized wine region. I guess you could say there is something for everyone! On the Burgundy side, the Jura is lower and flat, but as you approach Switzerland the hills climb like steps until you are surrounded by them. You may want to follow the Route des Lacs and visit several turquoise lakes during your visit. 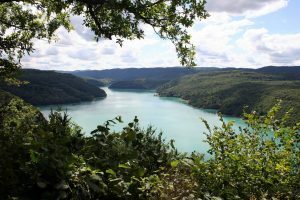 The largest natural lake, Lac de Chalain, lies to the north of the town of Clairvaux. It’s popular with locals and tourists and has 3 equipped beaches. Nearby are Les Cascades du Hérisson, near Baume-les-Messieurs. A cascade is a waterfall. While you’re in the area, check out the largest cave in the region, La grotte de Baume-les-Messieurs. 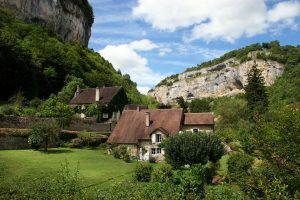 There are many caves you can visit, and Baume-les-Messieurs is one of France’s most beautiful villages. Lac Vouglans. This is a large, turquoise man-made lake with plenty of shoreline for relaxing and big enough for water sports. Clairvaux-les-Lacs is in a beautiful setting, at the foot of the regional natural park of the Haut-Jura, and is popular for swimming. There are two lakes linked by a canal, though only the main lake is open for swimming. Les Rousses, a cluster of four ski resorts for the family in an unpretentious setting on the Swiss border. A bonus is to discover the Comté cheese cellar at the nearby Fort. Summer sports are available also at the Lac des Rousses. Lac de Grandvaux: nearly a half-mile high you’ll find a glacier lake in the town of Grande-Riviere, near the 12th-century abbey of Grandvaux, now the abbey Saint-Claude. Only the church is there today. Nozeroy-Haute Vallée de la Saine is a dynamic yet medieval town which could be a jumping-off spot for hikes with the family. Saint-Claude is the pipe (smoking) capital of France, and not surprisingly, woodturning as well. In Dole, there are canals, lakes, boating, and biking. It’s a lovely, historic town as well. 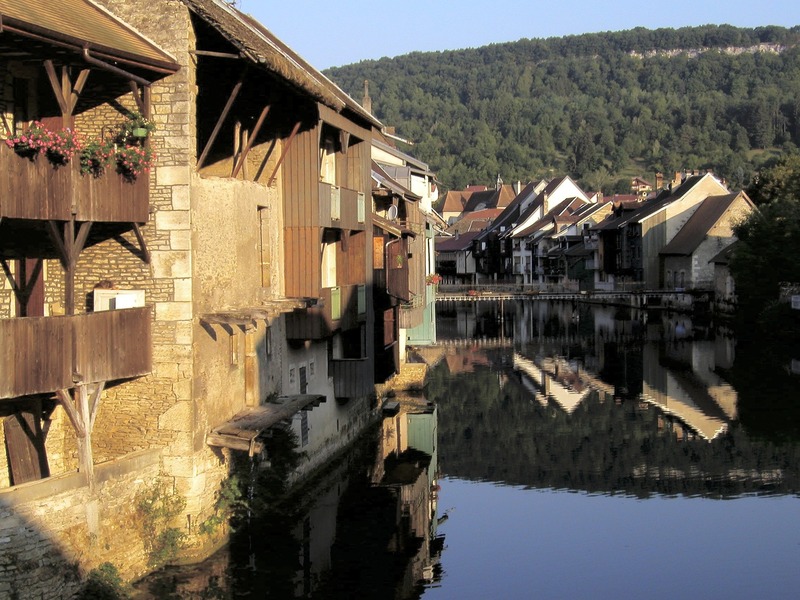 Stroll through Lons-le-Saunier, the capital of the region, and take advantage of the thermal baths. Arbois is the wine capital of the region, providing reds, rosés, whites, and jaune, or yellow, as well as sparkling wines (crémant de Jura.) Wine fans love it here in this small, but varied wine center. Salins-les-Bains is known for a rich history in salt mining, and for thermal baths. It’s a beautiful village tucked in the hills. For more information and more photos, check the Jura tourism site. As you can see, there is a lot to do and many feasts for the eyes as well in the Jura. comte, European lakes, France, France Lakes, French mountains, Jura, Lac Vouglans, Les Rousses ski area. Bookmark.